I can’t be the only designer/maker person in the world who has a love affair going with her tools. 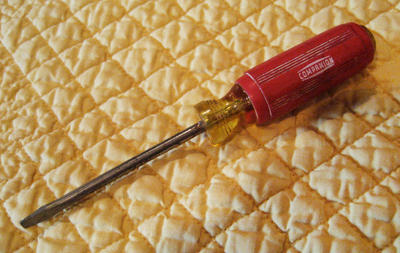 I’ve blogged about some very old tools used in my practice as a designer; here are a few pix of fave stitchery tools. 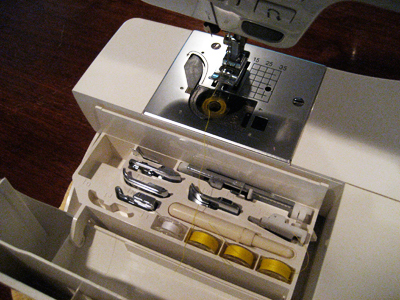 A very unsexy photo of one of my favorite aspects of my babylock sewing machine… the little hidden toolbox. Look at how perfect it is! The tiny compartments holding bobbins, a seam ripper, an extra foot. I find this so charming, esp. b/c the machine is pretty high tech, an embroidering computer really. And of course this dear thing always comforts. It morphs from holding pins to holding buttons, fabric scraps, ribbons… any old thing. 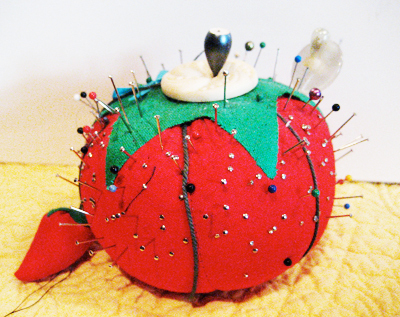 These tomato pin cushions have been around for so long they always make me think of my grandmothers and of carrying on stitchy traditions in spite of modern technologies. I know you people love your scissors like I do! 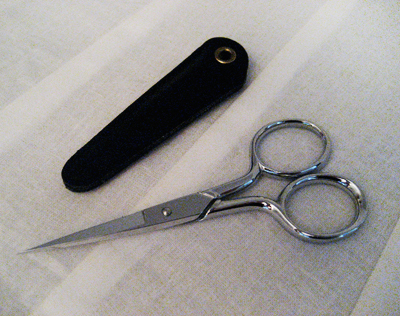 Above, my super sharp and pointy little snips for thread and detail work. Below, the big mama sheers which came nestled in a beautiful velvet lined gift box/coffin. 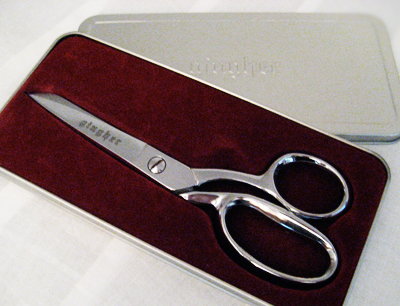 Both purchased a few years ago, I might never have bothered except for the incredible gothy typeface of the company name–Gingher— etched on the scissors and tin. And, below (as well as detailed at top of post) my dear tiny screwdriver, the perfect size for the screw that unlocks the machine’s needles. I have had this thing forEVER and have no idea where it came from. 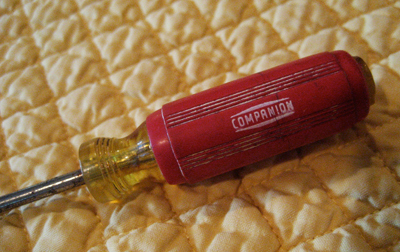 I have always loved the deco styling, the cherry red handle and the little golden bakelite piece but it was just today that I noticed the tiny white type reads: COMPANION. Yep! My So Charmed Life is proudly powered by WordPress.